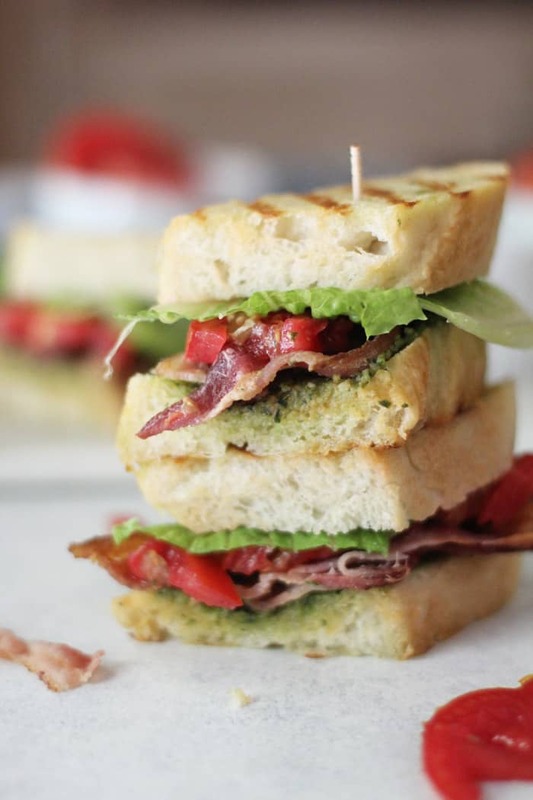 Try this BLT Sandwich with Pesto Sauce for your next easy weeknight dinner. 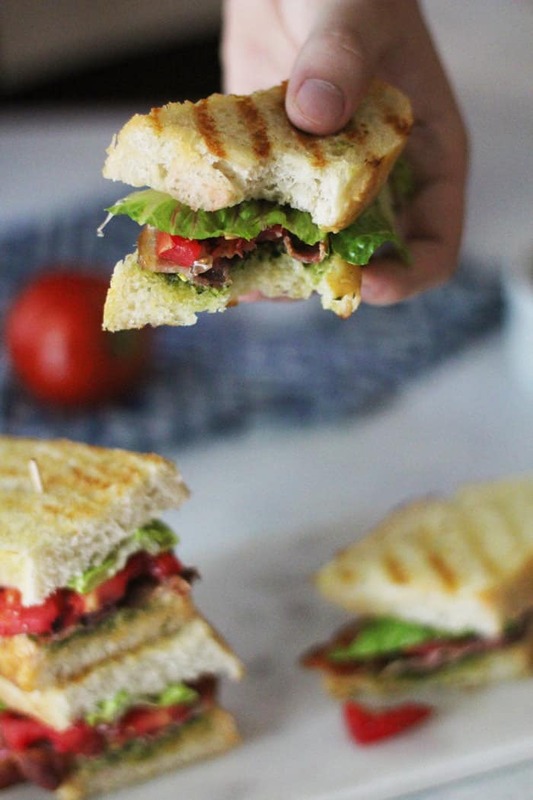 Having home grown tomatoes makes this sandwich even better. Ahhhh tomatoes. One of nature’s finest fruits, and one I’ve grown to love over the years. Sandwiches aren’t really complete without them, are they? My greenEST thumb friend, Kerri, recently brought a bucketload of tomatoes to our house. Some (but not all!) are pictured below. She has several gardens, and has seemingly mastered the art of Texas soil. 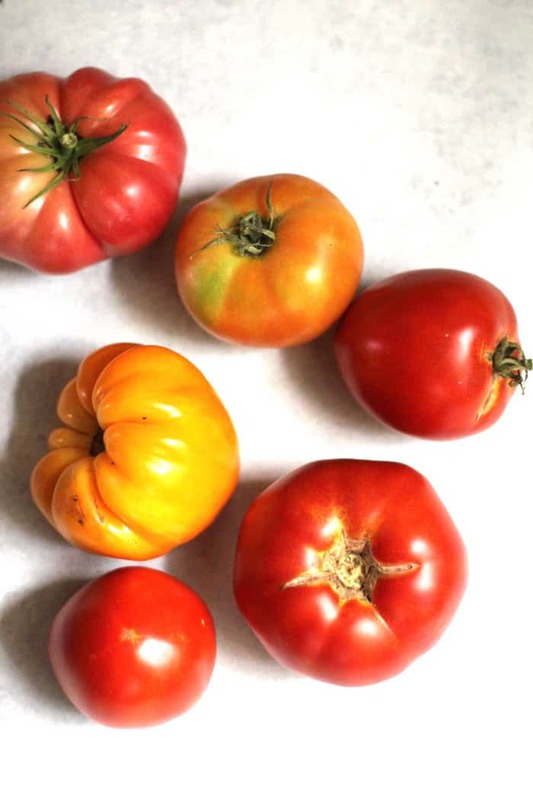 These tomatoes were delicious, and I turned the ones we couldn’t eat into homemade salsa. So this recipe isn’t complicated. But if you use the BEST ingredients, you’ll get the BEST sandwich. French bread or sourdough. I used my homemade Chewy French Bread, because I make it often and keep extra in the freezer. At. All. Times. Homemade Pesto Sauce. Use my homemade version for best results, or store bought is fine too. Crispy bacon. I make mine in the oven, using a rack to allow the grease to run off into a baking sheet. Romaine Lettuce. Or any kind will do. Home grown tomatoes – if you are lucky like me. Farmer’s Markets are great too. Not pictured – a dab of butter for the outsides of the bread. Making these sandwiches two days in a row didn’t disappoint my 19 year old. He’s a BLT fan, and while he knows how to make a sandwich, he loves to get a read on what I’m blogging on any given day. Benefits of having a mom who cooks a lot. 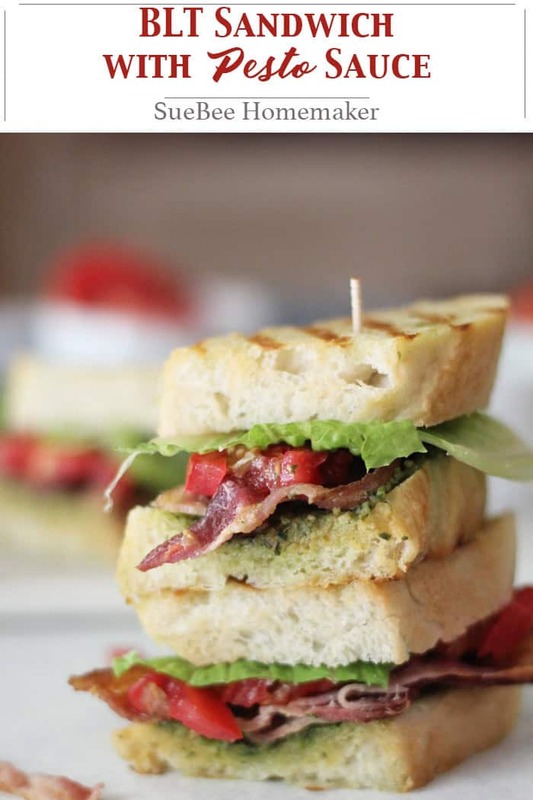 Gather up your ingredients, and make a sandwich that your family will be asking for again and again! Butter one side of the slices of bread. This will be the outside slices of the sandwiches. 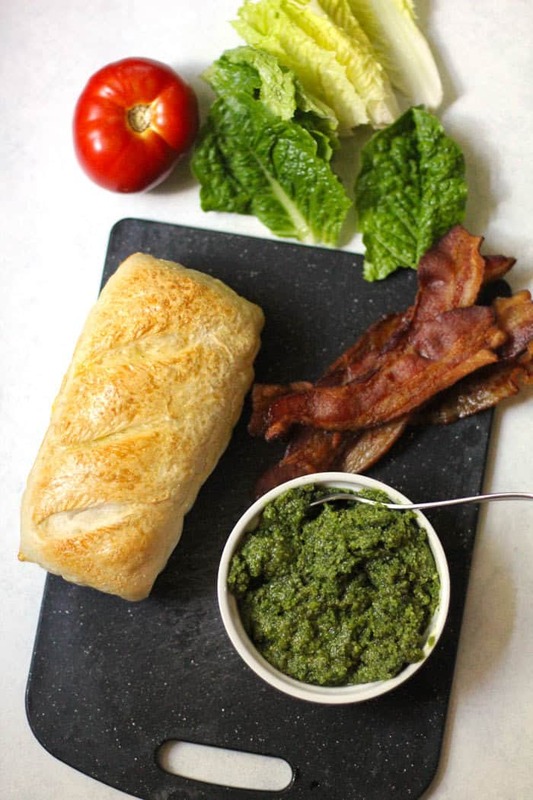 Spread pesto sauce on one side of two of the slices. Then layer with bacon, lettuce, and tomato. Place top slice on both sandwiches. Grill sandwiches on stove top (or use a panini press), until bread is slightly browned on both sides. 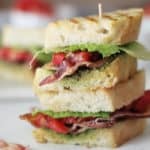 I grew up on the BLT and this recipe is a classic! Thanks so much for the reminder. I agree that getting some home grown tomatoes make it even more special.